At a team event at the Museo Storico Alfa Romeo, where the Italian car manufacturer celebrated their return to Formula One, the Sauber F1 team have announced their driver line-up for 2018. 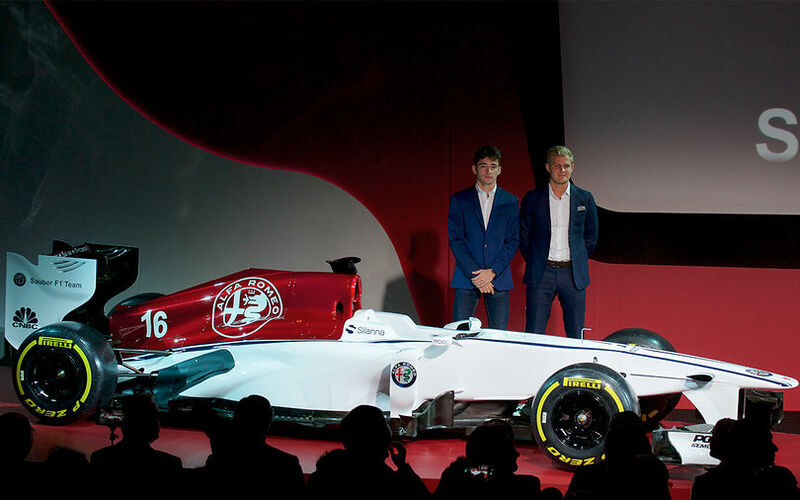 From behind a repainted Sauber in Alfa Romeo colours, Marcus Ericsson and Charles Leclerc were present to confirm their racing seats in 2018. Marcus Ericsson, who has been driving for the Sauber F1 Team since 2015, will go into his fourth season for the team, and fifth season in Formula One. Charles Leclerc, who completed four FP1 sessions and two tyre tests for the Sauber F1 Team in 2017, will join Ericsson for his first season as a race driver in Formula One. In addition to the new racing line-up, it was also announced that Ferrari protege Antonio Giovinazzi will complete six FP1 sessions for the Alfa Romeo Sauber F1 Team in 2018. “We are all delighted about the cooperation with Alfa Romeo", stated Frédéric Vasseur, Sauber Team Principal. "Today, we created the foundation for our partnership at the Alfa Romeo Museum in Arese, Italy. With Marcus (Ericsson) and Charles (Leclerc), we have a strong driver duo for the debut season of the Alfa Romeo Sauber F1 Team. Marcus is an experienced Formula One driver, who knows the procedures and the team well, after having worked together for the past 3 years. He is a team player, and has a very positive attitude. Even though both drivers said to be happy at the event, much will depend on the actual progress that Sauber will be able to make with its car. Sauber switched its focus early towards 2018, but even then, their next car will be powered by year-old power units from Ferrari. “I would like to congratulate the team on the new partnership with Alfa Romeo", said Marcus Ericsson. "It is a great honour for me to be driving for this team in 2018, and I am excited and proud to be part of this promising journey. I am confident that I can add to the knowledge and experience of the team. This winter is going to be very busy, and it will be important to push the development of the car in order to have a good start to the season. I am optimistic, that 2018 can be a big step and a good chance for us to move up in the field." Newcomer Charles Leclerc finally makes it into F1, thanks to Ferrrari, and is grateful for the chance.